Excerpted from The Secret Teachings of the Masonic Lodge by John Ankerberg & John Weldon, published by Moody Publishers, used with permission. According to most Masonic authorities, modern Freemasonry (also called “speculative” Masonry) can be traced to the founding of the first Grand Lodge in London in 1717. The Lodge is also a secret society. In fact, the Encyclopaedia Britannica classifies it as the largest secret society in the world. To maintain its secrets, Masonry uses symbolism, secret oaths, and secret rituals to instruct new members called “Initiates.” Each new member swears during these secret ceremonies to remain loyal to the Lodge and its teachings. The teachings instruct each new candidate how he is to serve and the rewards he can expect. In addition, Masonry views its mission in life as helping to bring the beliefs of all men into harmony—a harmony based primarily on Masonic teachings. Two of these teachings form the foundation of all Masonry. First is their belief in the universal fatherhood of God and brotherhood of man. By this, Masons teach that all men—Muslims, Jews, Hindus, Mormons, Buddhists, and Christians—regardless of their personal religious views, are the spiritual sons of God. Masonry’s second foundational belief is that reforming personal character and practicing good works will secure God’s favor...[and] will earn him a place in the “Celestial Lodge Above” (i.e., heaven). Masonry: The Same Yesterday, Today, and Tomorrow? The Ritual is only the external and extrinsic form. The doctrine of Freemasonry is everywhere the same. It is the Body which is unchangeable—remaining always and everywhere the same. The Ritual is but the outer garment which covers this Body, which is subject to continual variation. It is right and desirable that the Ritual should be made perfect, and everywhere alike. But if this be impossible, as it is, this at least will console us, that while the ceremonies, or Ritual, have varied at different periods, and still vary in different countries, the science and philosophy, the symbolism and the religion, of Freemasonry continue, and will continue, to be the same wherever true Freemasonry is practised. A vast amount of Masonic literature is available to the researcher. This includes at least 100,000 volumes, among which are a minimum of 600 analytical works....Also in print are numerous exposés of Masonry by former members who have revealed virtually all the secrets of the Craft. Thus, Masonry is a “secret society” only to those who have not read this literature. The Blue Lodge is the parent, or mother, Lodge of Freemasonry. In the Blue Lodge are conferred the first three degrees: (1) the Entered Apprentice, where a man is initiated into the beginning mysteries of the fraternity of Freemasonry; (2) the degree of Fellow Craft; and (3) the Master Mason Degree. Many, and probably most, Masons do stop with the first three degrees. But the candidate may choose to proceed higher along one or both of two branches in Masonry. One branch is known as the Scottish Rite, which advances by numerical degrees, beginning with the Fourth and ending with the 32d, the 33d Degree being either active or honorary. The other major branch is the York Rite...ending with the degree of Knights Templar. If you have been disappointed in the first three Degrees, as you have received them,...remember...that these antique and simple Degrees now stand like the broken columns of a roofless Druidic temple, in their rude and mutilated greatness; in many parts, also, corrupted by time, and disfigured by modern additions and absurd interpretations. They are but the entrance to the great Masonic Temple—Imagine not that you will become indeed a Mason by learning what is commonly called the “work,” or even by becoming familiar with our traditions....The streams of learning that now flow full and broad must be followed to their heads in the springs that well up in the remote past , and you will there find the origin and meaning of Masonry. Wagner’s assessment remains true. 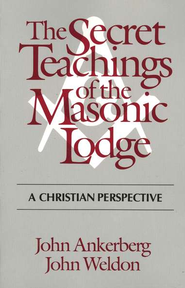 Critic Paul A. Fisher, who has had considerable experience in military intelligence and has been active in political life, refers to Masonry’s “enormous influence in the world media....” In the US, according to the leading Masonic magazine, The New Age , many members of the National Press Club are Masons. Fisher observes that Masons have dominated the US Supreme Court from 1941-1971....He concludes that such influence may have contributed to the high court’s “determination to move the nation away from an emphasis on Judeo-Christian values in public life,” helping to further secularize society and sustain “an epoch of revolutionary liberalism” with far reaching consequences. Masonry stresses the importance of secrecy for at least two principal reasons. The first is that the element of secrecy itself is something that attracts men and makes them feel important. They have access to what they believe are vital secrets and truths that other men do not share. The second reason is because it offers the Craft a stabilizing influence. Men who swear extremely solemn oaths of secrecy to the Lodge not only conclude that the information received is important but that it must be protected at all costs. Masons foresee the day when all religious division and sectarianism (i.e., what Masonry views as specific or exclusivistic, and therefore “divisive,” religious beliefs) will be wiped away, and a new era of universal peace, brotherhood, and religious faith will emerge. In this sense, Masonry is far more than a fraternal brotherhood. It seeks to remold the world after its own image. In other words, it wants to [“fundamentally transform”] the world.